The Philips AirBridge is the perfect companion for the Philips SpeechMike Premium Air or Philips SpeechOne Wireless Headset on the go. Simply pair the SpeechMike Air or SpeechOne with the Philips AirBridge and instantly benefit from lossless audio transmission. Switching between stationary and mobile use is simple, despite the AirBridge's small footprint, offering you the very same high quality lossless audio transmission as the docking station. The patented lossless audio transmission technology offers a level of quality which is unattainable from other wireless devices based of Bluetooth or DECT. This cutting edge technology ensures that every word is captured from the moment you press record. A warning signal notifies the author when moving out of the wireless range. - The Philips AirBridge provides reliable wireless connectivity for up to 5 meters distance to the SpeeechMike Premium Air or the Philips SpeechOne Headset. - The AirBridge works in the 2.4 GHz ISM band and uses a multi-channel frequency hopping technology with 8 - FSK modulation. - It provides a sampling rate of 44 kHz, 16 bit which equals CD-quality. - Robust audio streaming technology reduces the risk of drop outs or unwanted noise within the specified range. - Separated audio and data channels enable an instant command execution (e.g. Record/Stop) without any latencies. After a short 3 second initial pairing, automatic re-connection allows you to seamlessly switch between your docking station and your AirBridge, making it even easier and more convenient to get up and move away from your desk and dictate on the go. The familiar green and red coloured light indicates whether you are connected or not. Simply plug your previously paired Philips AirBridge into a computer on which you want to use your Philips SpeechMike Premium Air or SpeechOne Headset and you're ready to go. Because all of your settings are stored on the device, you can immediately continue working with another computer. The adapters convenient, compact design fits your pocket, meaning it can be easily taken along wherever you go. It is the ideal accessory to your SpeechMike Premium Air or the SpeechOne Wireless Dictation Headset giving you maximum freedom and flexibility for your working day. Depending on which device the Philips AirBridge is currently paired with, it simply appears as a SpeechMike Premium Air or a SpeechOne Wireless Headset to the computer. All features of the two devices like the SpeechMike event mode, the browser mode or the 3 custom button modes are available. Connecting a SpeechMike Premium or a SpeechOne via the Philips AirBridge to a Windows or Mac PC works like a charm. Virtual environments like Citrix or VmWare are also supported without any required driver changes. A SpeechMike Premium Air needs to be updated to firmware version 4.60 or later in order for users to enable and activate the pairing mode (press F1+F2 for 4 seconds) on the device. By default, a SpeechOne Wireless Headset can already pair with a Philips AirBridge. 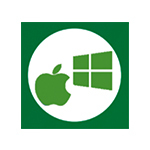 However, to enable the full functionality (e.g. automatic reconnect) it is highly recommended to update the SpeechOne firmware to version 5.22 or later. 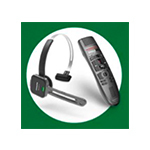 The Philips AirBridge Adapter (ACC4100) is the ideal device for users looking to quickly and easily use their SpeechOne Headset or SpeechMike Premium Air with multiple PCS's on the go. No longer do you need to carry around bulkier docking stations to carry on working with your wireless Philips dictation devices - simply connect the AirBridge USB adapter to whichever Mac OS or Windows PC, pair your device and you are ready to go. The audio quality is second to none thanks Philips' patented lossless audio transmission technology - so you can benefit from the very same levels of outstanding quality audio. Small, compact and convenient, the Philips ACC4100 AirBridge is a must have.